Brooklyn Nine-Nine star Chelsea Peretti revealed today that she will be leaving the show during its upcoming sixth season. Writing on Twitter, the actress said, "I won't be doing a full season of Brooklyn Nine Nine in Season 6. But that doesn’t mean I won’t ever be back, winky face emoji, heart emoji. I want to thank you for the hours you spent watching Gina be Gina". 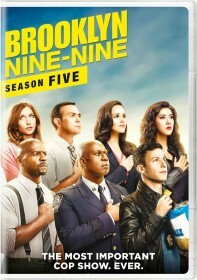 Peretti, who has starred as Gina Linetti since the show premiered in 2013, was absent for the first half of Brooklyn Nine-Nine's fifth season on maternity leave. Dan Goor, who co-created the show with Mike Schur, confirmed on Twitter that this will not be the last we see of Gina Linetti. Brooklyn Nine-Nine was cancelled by FOX earlier this year after five seasons on the network. NBC, whose studio produces the show, swooped in and saved the show. The network's order for a sixth season was recently expanded from 13 to 18 episodes, though a premiere date has yet to be announced.